On the evening of Friday August 17, District Attorney Rebekah Young sent an email to six of the seven defense attorneys (Jesse Ruben, representing Franklin Alcantara, was mistakenly not emailed) informing them that she was copying all evidence in the case to seven external hard drives for each attorney. At court on Monday, each of the defense attorneys was handed a document specifying the evidence now being supplied on an external hard drive. Judge Burdick said that he was trying to reach a consensus as to what has been in possession of the prosecution, and has not been produced to the defense attorneys. He stated that police relied on the review of video to determine who was inside the building after a notice of trespass was issued, therefore it is unfair to the defendants to not have access to the material evidence. District Attorney Young wanted to clarify that Detective Dave Gunter viewed video and printed still photographs. However, Young says, other SCPD officers identified people at the scene, not via watching video afterwards. DA Young stated that the court has not heard from these officers, some of whom were waiting outside the courtroom, including Sergeant Mike Harms and Detective Mike Hedley. DA Young stated that the Santa Cruz Police Department turned over 13 DVDs to the DA’s office, however the police inspectors were unable to make copies of 5 of the DVDs. The police technicians were not able to copy them either, so they reportedly came up the idea to create a YouTube channel and upload the video there. Defense Attorney Alexis Briggs stated that the YouTube channel was first allegedly created by the DA’s office to call on the public to help identify people in the videos for prosecution, not as a means to provide discovery evidence to the defendants. Judge Burdick posed a question asking if the DA ever stated that “all material” had been provided to the defense. According to defense attorneys, some of them had been told repeatedly that they were in possession of all discovery evidence. DA Young stated that she had an open-door policy the whole time, and lawyers welcome to visit her office and watch the videos at anytime. Defense attorneys stated that the DA never communicated this message to them, and Jessee Ruben said that in the past, Santa Cruz DAs have not been willing to share information in other unrelated cases. The DA stated that Santa Cruz County provides discovery evidence above and beyond what is required by law, noting that the case is still in a pretrial phase. That assertion, however, was challenged by the defense, who maintained that the discovery process has been both inadequate and deceitful. The DA stated that videos were uploaded to the Internet in a fashion that everyone has access to. Judge Burdick replied that the YouTube upload was incomplete. The DA replied that they uploaded all they could at the time, and over the weekend they purchased external hard drives for each of the defense attorneys. Judge Burdick declared the problem is that the preliminary hearing has been scheduled for two times already, and videos were previously not ready. The judge stated that he has ordered all the videos to be produced. He then noted that this is a high-profile case. There was a lot of discuss as to how and when the defendants were identified by the police. The DA stated that the defendants were identified by police officers on the scene. Alexis Briggs said this assertion was simply not true. Her client, Cameron Laurendau, was allegedly identified by the SCPD following an anonymous tip that he was pictured in a photograph published by the Santa Cruz Sentinel . Defense attorneys argued that the report they were handed that morning does not comply with the judge’s order to the DA on Friday. Judge Burdick asked the defense what they were missing. Alexis Brigs states that she did not have the photo from the Sentinel allegedly showing her client. There was discussion of a video allegedly showing her client, Cameron Laurendau, in conversation with police officers during the occupation of the vacant bank at 75 River Street. There was disagreement as to how Laurendau was identified by police, with DA Young insisting it was a face-to-face identification by the officers. Lisa McCamey, representing Brent Adams, said that she was not informed about the videos uploaded to YouTube. Rather, she was handed a stack of DVDs and told it was everything. Brian Hackett, attorney for Gabriella Riply-Phipps, joined in the comments previously expressed, and added that the inventory report the defense attorneys received that morning were not adequate. DA Young stated that she provided damage reports to defense attorney Dan Clymo, representing Becky Johnson, but did not realize other attorneys want it as well. Dan Clymo said he was handed a vat of videos, and believed that was the entirety. He was surprised on Friday at the confirmation hearing to learn there was more video. Shaneen Porter, defense attorney for Desiree Foster, the youngest of the Santa Cruz Eleven, raised the issue of how people were identified and charged. She noted that eleven people were charged out of the hundreds who were filmed and observed by police. DA Young replied that she plans to address how people were identified. David Beauvais, the lawyer representing Robert Norse, went over many dates of communication between Norse’s previous lawyer and DA Young. For example, on March 13 2012, a request for discovery was made. DA Young was also asked to produce policy regarding SCPD crowd control, as well as any policy regarding journalists at protests. Beauvais continued, pointing out that the court ordered the DA to produce discovery in May, yet on May 24, video still had not been received. Beauvais said the DA was engaging in harassment, including the refiling of dismissed charges, in a conspiracy case which is weak on its merits. “We’re asking the court to dismiss this case where lives have been disrupted. The case should be dismissed today with prejudice,” Beauvais asserted. Judge Burdick stated that the case has problems, continuing yet another preliminary hearing, and an easy order was not complied with by the DA. Burdick posed another question regarding the disclosure of evidence: “Was it bad faith, or sloppy work?” He answered his own question, saying that he did not believe DA Young was acting in bad faith, but clearly there was negligence by the district attorney. Judge Burdick asked if anyone wanted to respond, and DA Young quickly stood up to take some responsibility. Burdick asked why the evidence was not disclosed properly back in March. DA Young replied defensively that she just spent a great deal of money on her part to purchase external hard drives for each of the seven defense attorneys. 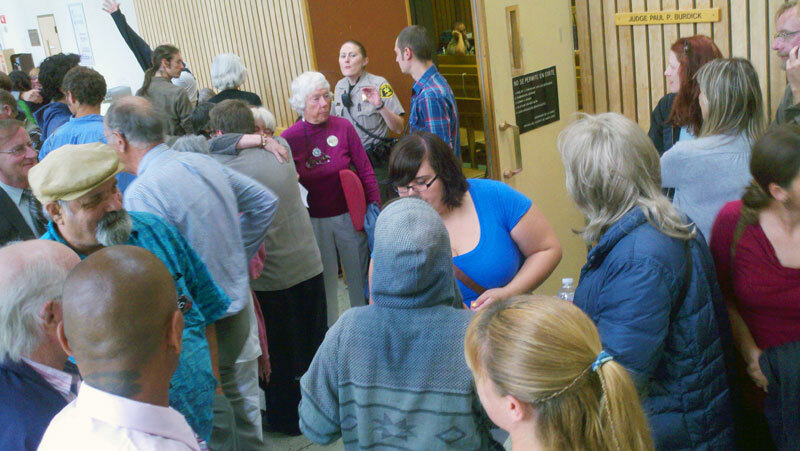 Outside the courtroom, supporters of the Santa Cruz Eleven expressed doubt that the money would be coming out of the DA’s pocket. In response to the failure to provide discovery evidence, DA Young said that she believes everyone is aware that, “none of us are technical geniuses.” DA Young then said she found a great solution in the external hard drives, and that she was not acting in bad faith. The DA suggested to the judge that he discipline the DA’s office, but pleaded with him to not throw out the case. “The People have a right to try the case,” he said. Judge Burdick then made his feelings for the day clear by saying he does not think his discretion is best used by dismissing this case. He felt that DA Young was not acting in bad faith, but that she was clearly negligent. The judge said the preliminary hearing will be moved to a later date. Judge Burdick stated that he was not inclined to grant a motion to dismiss the case. Rather, he may issue a sanction to the DA’s office. Alexis Briggs and Jesse Ruben, representing Cameron Laurendau and Franklin Alcantara, said they would like to file a motion to dismiss based on the refiling of charges against their clients. A hearing on the motion to dismiss for Laurendau and Alcantara was scheduled for Tuesday October 9 at 8:15 a.m.
Due to the difficulty in scheduling for seven defense attorneys with busy schedules, the new date for a preliminary hearing was scheduled for five months away, in 2013. A confirmation hearing was scheduled on January 4 2013 at 9:00 a.m., followed by a preliminary hearing on Monday January 7.